This pool was greenish from oxidized iron and lower alkalinity. 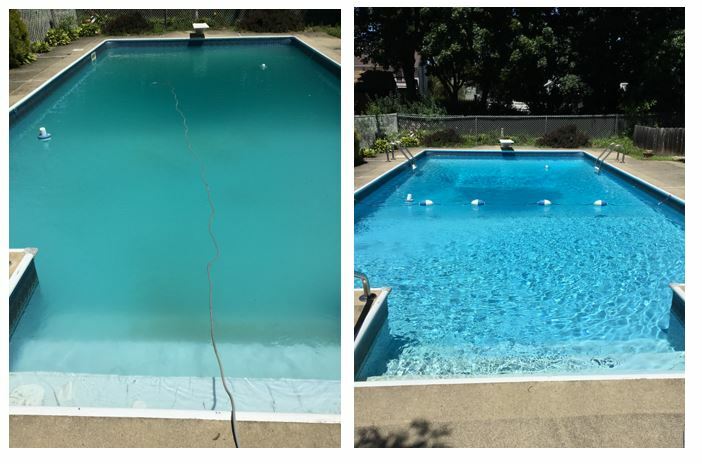 After the chemistry was balanced and a CuLator Ultra 4.0 was used to remove the metals from the water, the pool stair stains were gone, the cloudiness was gone, and the metals were out of the pool water. I placed the CU Lator in the skimmer basket last week. The results from the test at Leslie’s is no copper. The chlorine and other test items were just about ok. So yesterday the family used the pool. I want to thank you for the product, CU Lator, and the kind and attentive assistance you gave to me in getting my pool dilemma resolved. Now I will have to learn how to balance the pool chemicals, so it does not repeat again. This entry was posted in CuLator Stain Treatment, CuLator Ultra 4.0, Uncategorized and tagged before and after, culator, swimming pool stains, ultra 4.0. Bookmark the permalink. ← Is CuLator a good choice for issues with blonde hair turning green?